Should I accept what the insurance company is offering me after a car accident? What should I bring in for my first car accident case consultation? Am I allowed to switch lawyers? Should I? 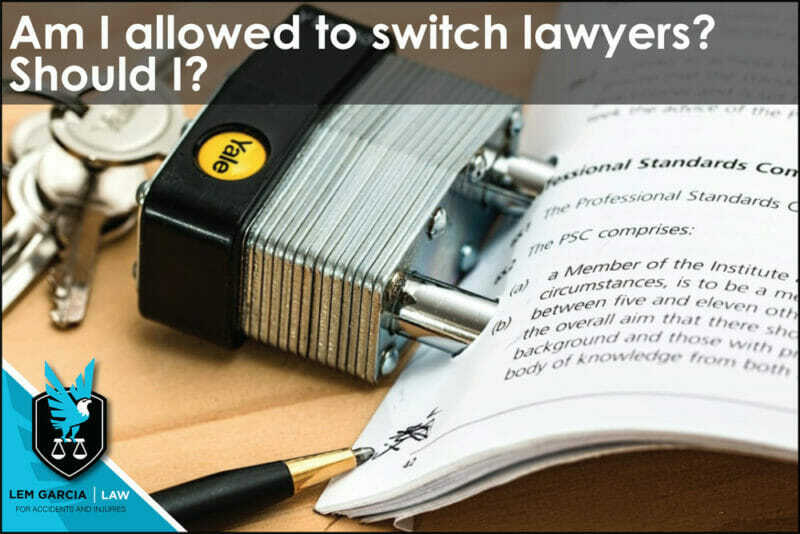 Generally, you are allowed to switch lawyers in the middle of your case. Whatever your reason for getting another attorney may be, you are allowed to drop your current attorney and hire another one. If you discharge your current attorney, your current attorney (now former) has the duty to provide your entire file to your new attorney within a reasonable amount of time. For example, if you have an attorney for a car accident case, and you feel that he or she is not doing a good job for you, you may elect to discharge your current attorney and find another one. Your new attorney will ask you to sign documents that allow him or her to substitute for your former attorney. Your new attorney will send those documents to your former attorney and once received, you will have the new attorney working for you. While it is relatively simple to switch attorneys, it is not always the best idea for you to do so. If the relationship with your current attorney can be mended, it may be a good idea to mend the relationship before seeking the help of another attorney. A relationship that is mended may help you avoid future problems that can arise when you hire a new attorney. First, it may take a while for your new attorney to get up to speed on your case. Second, your former attorney will have a lien against the case for the work he or she did for you. Third, the problem with the former attorney may be able to get mended easily, which would result in the problem getting solved easily. If you feel that the relationship cannot be mended, getting a new attorney is something you should look into. Make sure to choose wisely the second time around. If you do not like your second attorney, and want to get rid of him or her, it will be more difficult to find a third attorney to take your case because you have developed a pattern on your case that you might be a difficult client to help or appear to be one that cannot be satisfied. At Lem Garcia Law, we are often asked for second opinion and/or to substitute other attorney out. We are happy to provide consultations to people who are unhappy with their current attorney, but we do try to mend the relationship if possible. If we believe that it is best for you to stay with your current attorney instead of abruptly switching attorneys, we will let you know. In the end, the goal is to make sure that you are receiving the proper representation on your case. When you are looking for West Covina car accident attorney, or one in Southern California, please give us a call for a free, no-obligation, consultation.